Reading Fun for the Whole Fambly! When Jennifer Senior became a parent, she naturally started thinking about parenthood. But when she sat down to write her book, she took a seemingly radical approach to the subject. Rather than offer advice about how to raise a child, she decided instead to see what was happening to parents when a child entered their lives. She decided, in effect, to turn the usual book upside-down. 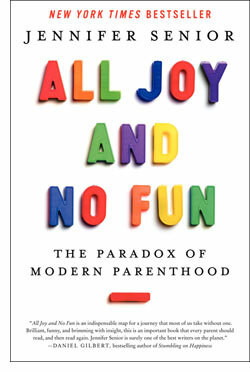 The result, 'All Joy and No Fun: The Paradox of Modern Parenthood,' is every bit as engaging you might hope, and then some. Senior's inversion of the usual approach offers readers a truly unique look parenthood in modern American middle-class culture. Moreover, she's set up her writing project so that the prose itself becomes a sort of Petri dish. Her data-collection method is rigorous and intelligent, and the data she gets is fantastic reading. Consider this book itself both the experiment and a report on the results. Welcome to social science in the 21st century! Senior's question — what happens when a child (or children) come into the lives of parent(s) — was itself a breakthrough. But she needed a place to see it play out. What she found was an invaluable resource to the book, the Early Childhood Family Education (ECFE) program in Minnesota. It's where young families, mostly middle class, can go, with their children, to get advice on how to handle their new lives. Part of the ECFE program lets the parents take a breather and de-compress with one another while a caretaker from the program watches the children. Here's where Senior found a pristine data pool of young parents in a mood to talk frankly. Chatting, recording, typing, she took it all in, and then simmers it in crystalline, entertaining-as-all-get-out stories, sorted into larger categories she saw emerging in the stories themselves. Senior helpfully divvies this all up into a few broad categories, including autonomy, marriage, simple gifts, concerted cultivation and joy. Each of these subdivided again, and in each we read stories that demonstrate what happens to parents. It's Senior's sense of storytelling as data that carries the day. She knows how to give us crisp, precise prose wrapped around a great parental anecdote. The plotting of this book, so to speak, is intricate and very involving. For all that her conclusions about parenthood are wildly illuminating, it's Senior's charters that readers are going to remember most. Stay-at-home dads and grandmother moms are powerful, poignant and sometimes hilarious. This is humanity at its best, strikingly real and gritty, filled with sweetness, frustration and ambition. Senior's book has a subtle subtext about the needs for more government support for families. Many of the difficulties these families face could be easily leavened by state and federal money well spent. Senior's book offers a detailed picture not just of what is there, but also, of what is missing. No matter what your interest, whether you are a prospective parent or simply a tax-paying American, (or both) 'All Joy and No Fun' is a book you can read with the assurance that there is lots of fun in the reading experience yourself. Jennifer Senior weaves little stories into a whole much larger than the sum of its parts. With precision and insight, she proves that social science can live up to both parts of its description.